The goals of the following guide are two-fold: Firstly, to install a software package called FFmpeg, which contains numerous tools to facilitate the recording and manipulation of audio-video materials, along with several optional packages known as codecs. Secondly, I aim not only to present a series of steps and commands, but also to provide a little illumination into the process, providing an overview of some of the key tools and concepts behind obtaining, building, and installing software on a Linux platform. Please see the my earlier post: What is RetroPie? for a little background on both RetroPie and RetroArch. My primary motivation for installing FFmpeg was to be able to capture real-time footage of gameplay from various console systems available in the RetroPie emulator suite, a number of which utilise the RetroArch framework that provides a facility to make live audio-video recordings. As defined by the project’s Wikipedia page, FFmpeg is a free software project that produces libraries and programs for handling multimedia data. FFmpeg includes libavcodec, an audio/video codec library… libavformat, an audio/video container mux and demux library, and the ffmpeg command line program for transcoding multimedia files. A key component, FFmpeg, is required for in-game recording to work; unfortunately Raspbian, the operating system based on Debian Linux which underpins RetroPie, does not come with this package pre-installed; this limitation can be overcome, albeit with a little effort. For those users coming from a Windows background, installing software on the Raspberry Pi can seem a little complicated, certainly in comparison to simply downloading and double-clicking a file. Software installation on the Pi can, however, be very straightforward, thanks to the Advanced Packing Tool (APT) provided by the Raspbian Linux operating system. Rather than downloading a file in a browser, with APT the command line is used to request a package from a repository, a catalogue of software known to be compatible with the specific installation of Raspbian being used. Not all compatible software is available in the repository, and, as is conventional in the Linux world, often packages need to be compiled from raw source code. 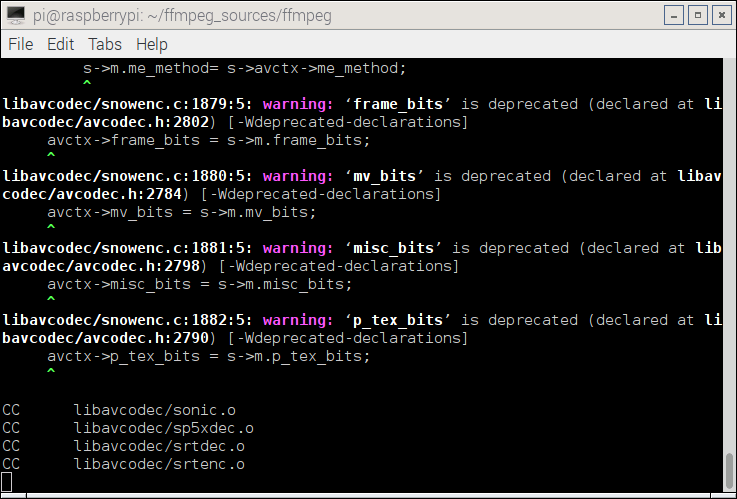 This is the case with several of the FFmpeg codecs, and indeed the FFmpeg suite itself. The following does not necessarily represent the most optimal way to achieve the aim of obtaining and installing a custom version of FFmpeg, as with all things Linux there are many different approaches to reach a goal. I’d like to note that the foundation of this post was the Ubuntu FFmpeg Compilation Guide, which I have expanded and adapted for specific compatibility with the Raspberry Pi in general, and the RetroArch emulator core in particular. FFmpeg can utilise a vast array of codecs; when building the suite from source code we are free we are free to include or exclude these at will. 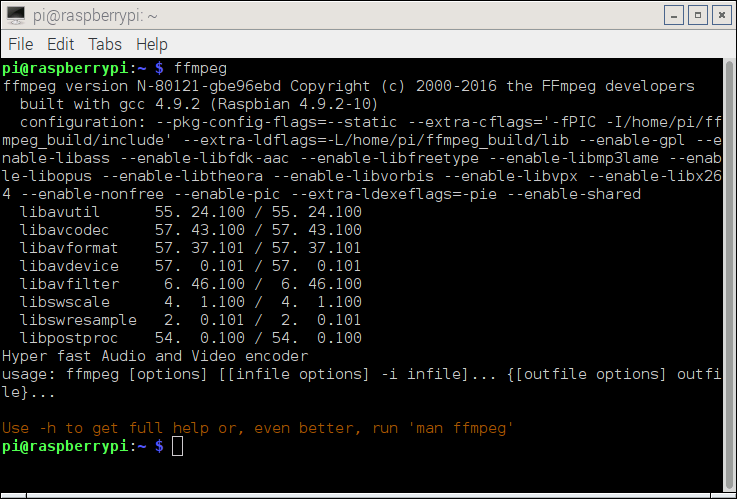 Some components required by FFmpeg are available from Raspbian’s APT repository, whilst others, especially codecs, must be built from source code. Of the components available via APT, these are not necessarily the latest versions, as is the case with the x264 codec, in which case we may choose to build from source. When compiling FFmpeg it is necessary to have installed all required codec components prior to the building and installation of FFmpeg itself. For compatibility with RetroArch the codecs utilised by FFmpreg must be built as shared, as opposed to static, libraries. Library of object code which is linked with, and becomes part of the application. There is only one form of this library but it can be used in two ways. Dynamically linked at run time but statically aware. The libraries must be available during compile/link phase. The shared objects are not included into the executable component but are tied to the execution. Dynamically loaded/unloaded and linked during execution (i.e. browser plug-in) using the dynamic linking loader system functions. 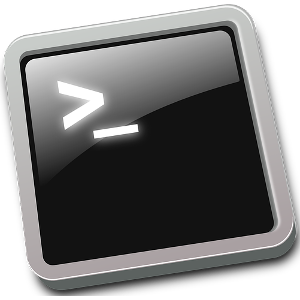 The configure script generates the makefile, which contains commands to actually compile an executable or library file. As the name suggests, the purpose of the script is to customise the software being built. This causes the build process for the component to create shared library file(s), which can be linked to by FFmpeg; conventionally such files have an extension of .so. Rather than using the configure script paramater --prefix to specify a destination folder for the result of the component build, we must remove this to cause each component we build to be output to the default directory of /usr/local. This prevents difficulties later with ffmpeg, and other software, being unable to locate the library files; whilst this issue can be overcome by setting search paths, this requires additional effort and introduces the risk of incorrect configuration. The make command triggers the compilation of source code into executable files or libraries by executing a makefile script which has been built by the configure script. For more information regarding overclocking and underclocking, please see my previous post entitled Overclocking the Raspberry Pi 3: Thermal Limits and Optimising for Single vs Multicore Performance. A full image of the Raspberry Pi’s SD Card can be made using a tool such as Win32DiskImager. Is a package available in the APT cache, and if so, which version? Where are the components of a package installed to? For a description of each package contained in the above command, please see the supplementary information page. Yasm is a complete rewrite of the NASM assembler. It supports multiple assembler syntaxes (eg, NASM, GAS, TASM, etc.) in addition to multiple output object formats (binary objects, COFF, Win32, ELF32, ELF64) and even multiple instruction sets (including AMD64). It also has an optimiser module. The following is a more specific value, but I have only seen this referenced in cross-compiler guides, rather than those for local Raspberry Pi use. The x264 package is available in the APT repository, however it is not the latest version (which contains experimental support for Raspberry Pi x264 hardware encoding). To benefit from the latest features, I chose to build x264 from source. LAME (LAME Ain't an MP3 Encoder) is a research project for learning about and improving MP3 encoding technology. LAME includes an MP3 encoding library, a simple frontend application, and other tools for sound analysis, as well as convenience tools. The Opus codec is designed for interactive speech and audio transmission over the Internet. It is designed by the IETF Codec Working Group and incorporates technology from Skype's SILK codec and Xiph.Org's CELT codec. --enable-shared is only supported on ELF; assuming this is OK - it is. VP8 and VP9 are open video codecs, originally developed by On2 and released as open source by Google Inc. They are the successor of the VP3 codec, on which the Theora codec was based. PATH is a system variable which can be modified to allow the system to locate required shared libraries, executable files, etc, during the compilation process in arbitrary locations. The following code builds FFmpeg from scratch, using the latest source version, and utilising shared libraries for codec components. The current versions of required codecs and components are used in most instances in a bid to rule out incompatibilities due to mix-and-match versions of components. Note: the directory /home/pi/bin is not required to exist before running the FFmpeg compilation routine. As noted in each codec-specific section, above, if a specific codec is required in your build of FFmpeg, the appropriate parameter must be passed to FFmpeg's configure script. a very fast video and audio converter that can also grab from a live audio/video source. It can also convert between arbitrary sample rates and resize video on the fly with a high quality polyphase filter. gathers information from multimedia streams and prints it in human- and machine-readable fashion. For example it can be used to check the format of the container used by a multimedia stream and the format and type of each media stream contained in it. a streaming server for both audio and video. It supports several live feeds, streaming from files and time shifting on live feeds. You can seek to positions in the past on each live feed, provided you specify a big enough feed storage. a very simple and portable media player using the FFmpeg libraries and the SDL library. It is mostly used as a testbed for the various FFmpeg APIs. All descriptions are from the FFmpeg project's official documentation. Note: during the compilation process, expect to see a number of warning messages emitted by the compiler - these are normal, and do not indicate failure. On a Raspberry Pi 3, overclocked to 1350mhz, the make command for FFmpeg took approximately 35 minutes. The same solution applies, namely rebuilding the library cache using the ldconfig command. The above code retrieves the source for the latest FFmpeg release, contained within an archive named ffmpeg-snapshot.tar.bz2. A complete all-in-one script of the above code is available here, along with instructions for creating and executing the script file. The FFmpeg suite facilitates the modification and transcoding (conversion between formats) of audio and/or video files with almost unlimited flexibility, and as such is a huge topic in its own right. The following are some examples to introduce the basic concepts and functionality. Note: both qp and crf specify a value of 0 for lossless, however this causes corrupt video when played back using the Raspberry Pi's default Omxplayer; the video is however fine when viewed using other software, for example VLC. Hi, sorry to hear you’re having problems. Thanks! With the combined info from these resources hopefully somebody can work out how to stream live gameplay from RetroArch emulators in RetroPie. I’m not going to make an account for a forum that I’ll never use, other than for this one thing. Anyways, I got it working, but N64 and NES are both completely unplayable while recording. I got the newest retropie (4.?) and the newest retroarch (1.3.8?). I’m glad you have it working, albeit not as well as would be hoped. Unfortunately neither the NES nor the N64 are amongst the many emulators I’ve tried recording on – the Atari VCS / 2600, Atari 800 (custom retroarch build), SNES, Megadrive, 32X, Spectrum (Fuse), and PlayStation all record at full frame rate with all games I’ve tested. The retroarch core N64 emulator is notoriously inefficient compared to the standalone Mupen64plus, even without the overhead of recording; it’s a common topic on the forum, where most users optimise for the non-retroarch version (which unfortunately means no ffmpeg features). The n64 struggles to emulate many titles due to the nature of the GPU’s microcode; there are compatibility lists linked to in posts on the forum (you can browse and search without requiring an account). Super Mario 64 is probably the best performing title on the retroarch core – does recording work with this? One major factor is the destination for the output files – are you recording to an external USB hard disk? This is a must for the more advanced emulators as writing to the Pi’s internally mounted SD card really affects performance. The recording approach in the guide was first implemented on RetroPie 3.6, and subsequently tested in 3.7 and 3.8. The most recent version I’ve used it on is 4, release candidate 1. 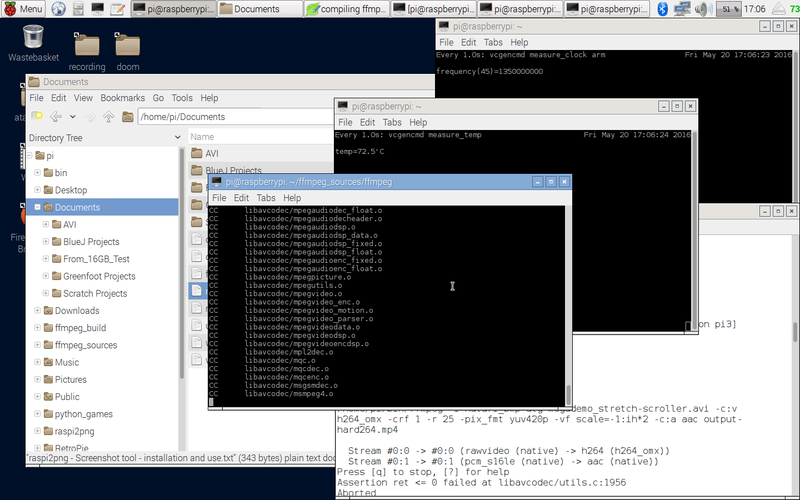 Hi there, I have successful install FFmpeg for Rasp and streamming it to Local web.